One of the “fun” aspects in paging through wartime magazines like the Picture Post is reading the advertisements. Many have a wartime flavor to them which is no surprise. But what is interesting to me is the sacrifice being made to win the war. We think it’s a hardship to run out of coffee when all we have to do is run to the nearby grocery store. Our parents and grandparents had coffee rationed as well as hundreds of other things. Here’s a glimpse of the ads in the December 4th, 1943 Picture Post a UK magazine that ran from 1938-57. 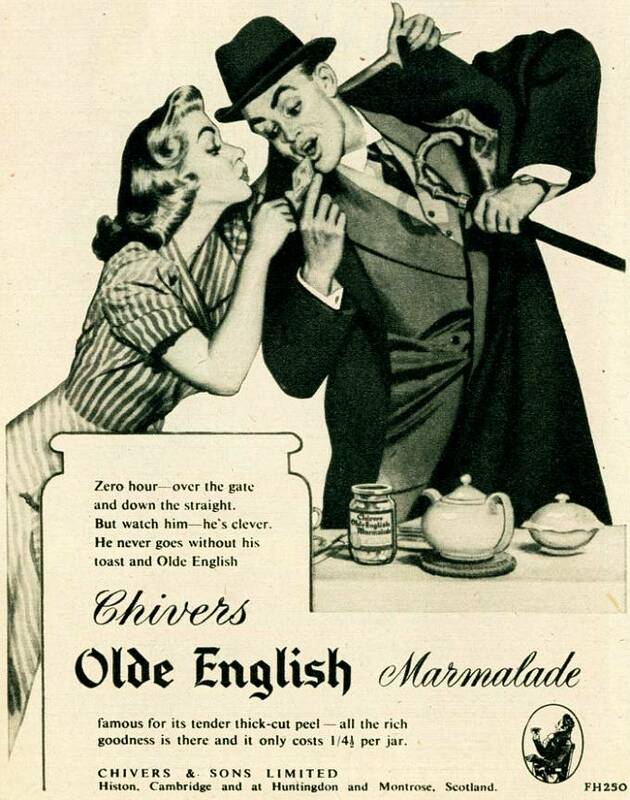 Chivers was (is) an English company specializing in fruit products, The ad tells the reader that Olde English Marmalade is no longer available because of an orange shortage. The company goes on to say other products are still available and urges that the war is won quickly. By December 1943 the UK had been at war for four years and the US just a little over a year. It’s a subtle suggestion that Britain is war-weary, yet a reminder that Chivers is patriotic and doing their part for Britain’s military. Chivers Marmalade ad, post war. The company is still in business and the products available in the US. Candy company offering the best value for a ration coupon. Prices were apparently fixed by the government. Britain is an island and most of everything had to be imported from the US, Canada and other places. Shipping space would be a premium and ingredients to make candy would have low priority. 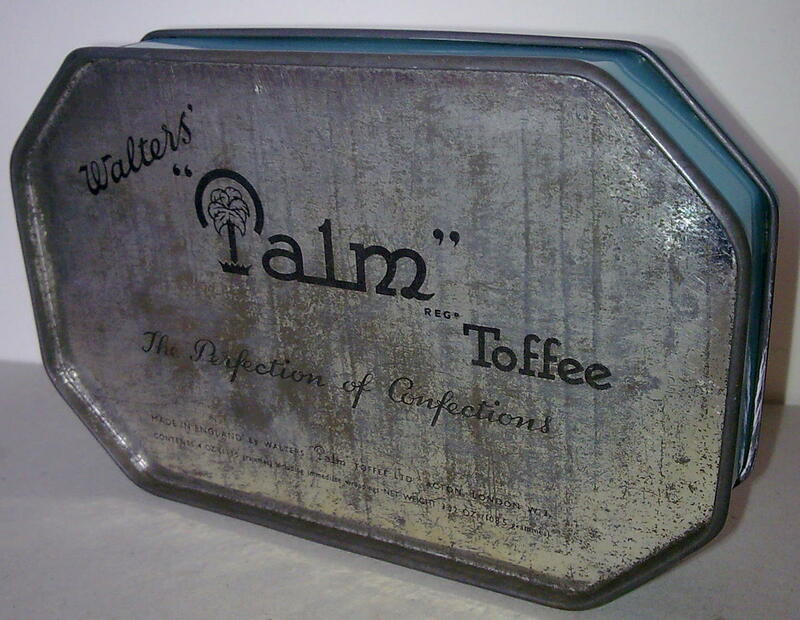 Palm Toffee tin, perhaps wartime. Each candy was wrapped in a palm tree wrapper. If your country is being bombed you could see where this would be handy! It would be great to find one of these war-time books in a used book store. I think the ad also indicates the “total involvement” of the population. For example, unless you know of someone personally in Afghanistan the war over there is a bit of an abstraction requiring virtually no sacrifice on the part of the American people (the UK as well for that matter as they have troops there too). This was not the case in WW2 especially in Britain. Sacrifice was required by all and so interest was high because war was not a remote abstraction. Imaginary conversation between a person known as a “Fuel Watcher” and housewife. The ad is an encouragement to heat only one room at a time to save fuel. The ad indicates that most British homes were coal heated and that room temperature could be controlled by the room. The conversation revolves around the idea of hanging out in the kitchen using warmth from the sun and from the stove. The ad reminded me of some of the older homes I’ve seen. Many had a coal bin in the basement, usually empty. By the 60’s when I grew up most American homes had converted to oil heating and homes had this huge tank in the basement where the coal bin had been. When my wife and I first were married we lived in such an old home. 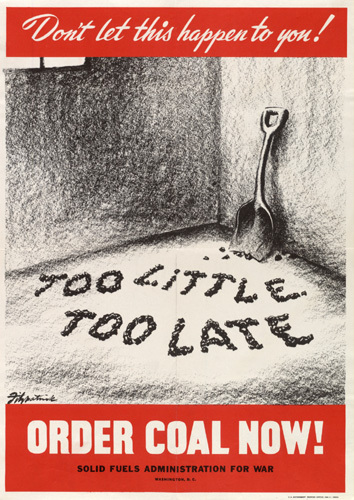 Coal was rationed in the US too. This ad is American. This ad is in cartoon form and it tells the story of a housewife who uses rationing coupons to buy new shirts rather than the raincoat he says he needed. The women’s reasoning was the shirts wore out because she had to boil them and hard rub them thus wearing them out. 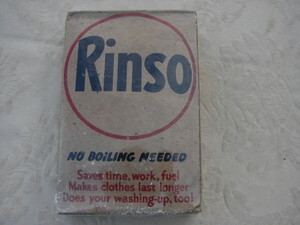 Her friend comes to the rescue by encouraging her to use a product called “Rinso.” The ad promises that Rinso will eliminate boiling a and make the shirts last longer. Again the moral of the story seems to be making the best decisions with a limited number of rationing coupons. “A spot of bother” is British slang for a problem, something to bother about. This ad is very interesting. It encourages the folks at home to purchase tobacco products to send to their love ones who are POWS overseas. The ad excludes POWS in Japanese hands presumably because the Japanese were not cooperative with Red Cross efforts. Iconic picture from WW1. A German POW gives a British Tommy a light. 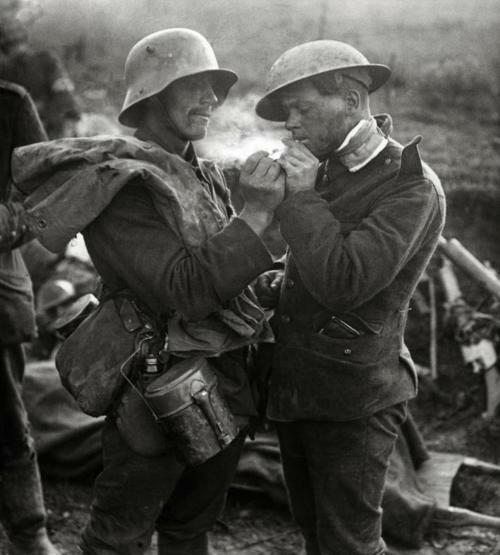 Cigarettes were important to most soldiers in both wars. My dad told me he learned to smoke in the army in 1945. It would hasten his death. He could never quit for long. Another best value for the coupon type ad. It features a distinguished looking gent with a hat, pipe and nice long dress type overcoat. They are asking for 16 coupons +79’6. I assume the 79’6 refers to British money, maybe 79 pounds and change. I think 79 pounds in 1943 was a rather large sum for the average person. This ad was put in by the Fire Office Committee. The ad says 6000 army lorries (trucks) were immobilized because the rubber was burned in a fire. No rubber, no tires is the idea. The fire was started by a careless cigarette smoker. Other aspects of the ad indicate an anti-smoking bent or anti-chain smoking bent to be precise. The idea seems to be the more smoking the more chances for carelessness and thus harming the war effort. Reading through the ads certainly gives the sense that even the smallest things mattered in helping win the war. 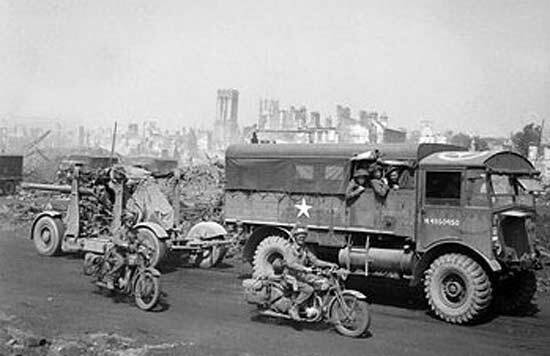 British Lorry towing an artillery piece. The destruction of enough rubber for 6000 lorries would not be a laughing matter. Rubber was a vital commodity during the war. A quick count tells me that the about 50% of the ads are directly related to the war even if the ad just mentions the rationing aspect. I wonder how our entitlement culture would handle the rationing that British (esp British), American and Commonwealth countries experienced during WW2. 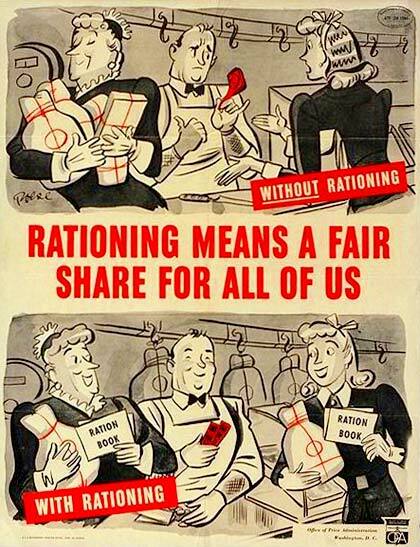 Rationing was a way of life in Britain, Canada, the US and other countries. The ads were everywhere and it was patriotic to make these sacrifices. I doubt our modern cultures would be willing to endure the same. British rationing continued long after the war. The main reason was the poor state of the economy, but others included the need to feed people in other parts of Europe, the large number of troops who remained overseas and thus not part of the workforce and the left wing Labour government’s liking for centralised economic planning. The continuance of rationing was one of the reasons why Labour, which had won a landslide victory in the 1945 election, won only narrowly in 1950 and lost the next year. However, it was not until 1954 that rationing was abolished. On the other hand, British rationing was so fair that people at the bottom end of the social scale ate better during the war than before it. I am generally cautious of Wikipedia, as anybody can change it and then link to it in order to support a view they have expressed elsewhere online. However, its article on ‘Rationing in the United Kingdom’ looks to be well researched. Thanks once again Martin for coming by and adding to the blog with all that information. I had no idea that rationing continued that long. I never quite understood Churchill losing the 45 election either but that’s another topic. Excellent research and photos for this topic. Thank you. Means a lot getting encouragement from you and Martin two outstanding historians!